One of the greatest female vocalists in rock history, possessing not only one of the most powerful voices the genre had ever known but also in full command of every emotional nuance a song required and versatile enough to handle any type of material from bluesy to jazzy to gospelish to torch songs and uptempo barnburners and make it all seem as natural as breathing. Born Mabel Smith in Jackson, Tennessee in 1924 she was singing professionally as a teenager in traveling road shows and by age 20 laid down her first recorded sides working with Christine Chatman. Three years later, signed to the growing independent powerhouse King Records she cut a handful of records with some top flight sidemen but the label remained unsure of her direction and she consequently went without a recording contract for five years. 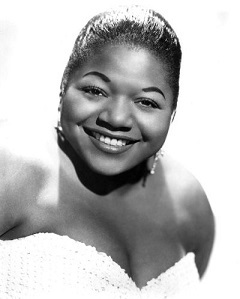 In 1952 she was signed to the OKeh label by renown producer Fred Mendlesohn who rechristened her Big Maybelle and surrounded her with some of the top musicians in the field, including bandleader Leroy Kirkland, and was immediately rewarded with three Top Ten hits in her first year with the company. Though the hits dried up after that, her talents expanded and the work she put out, including many of her own compositions, placed her among the most respected female singers in all of rock. With her deep emotional commitment to the songs, her trademark squeal making the 250 pound rough living Smith sound oddly vulnerable, and a stage show that witnesses claimed was riveting in its intensity at times, she was an imposing figure on the scene for a suddenly younger, whiter and far less worldly crowd. So upon her move to Savoy Records she changed her stylistic bent and featured more uptown arrangements of classier torch material, including what would become her signature song, “Candy”, which returned her to the charts in 1956. Though she still was more than capable of rocking out when need be, she also proved herself to be a top flight star in other fields and was one of just three rock artists, along with Chuck Berry and Ray Charles, to appear in the acclaimed 1959 documentary, Jazz On A Summer’s Day, which featured such luminaries as Thelonious Monk, Dinah Washington, Chico Hamilton, Mahalia Jackson and Louis Armstrong. Her drug addiction to heroin was getting worse and in the 1960’s she bounced from one label to another, yet still was churning out some incredible work in a more soulful style of rock, as well as cutting a handful of gospel sides that were chilling. She scored a final, unlikely, hit with a cover of the garage rocker “96 Tears” in 1967 but with her health deteriorating with diabetes in addition to the downward spiral of drugs, Maybelle’s immense voice was silenced in 1972.